ANDY OnCall® is a handyman repair service company that sends a qualified craftsman for a FREE ESTIMATE to homeowners needing small jobs, remodels, repairs and maintenance. All of your home improvement needs can be taken care of with one phone call. ANDY OnCall® also provides a one year WRITTEN WARRANTY. Whether you have a large job, minor home repairs, or just need help checking off your honey-do list, ANDY OnCall® is here to help. Simply contact your local ANDY OnCall® location and we will be happy to provide you with a free estimate. Each ANDY OnCall® location is independently owned, operated and fully insured. We are dedicated to using capable, qualified craftsmen to perform our services. We back up our service with a One Year Written Warranty on craftsman workmanship. You can rest assured knowing the work was done well! You don’t pay until job is completed to your satisfaction! 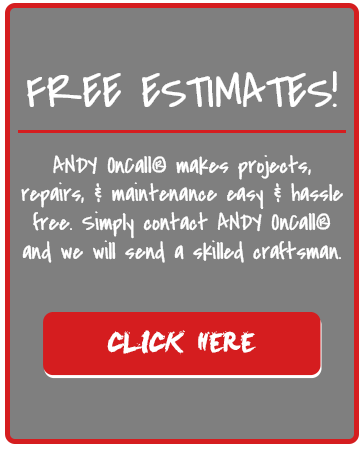 ANDY OnCall® handyman service makes projects, repairs & maintenance easy & hassle free. When you need a home repair, simply contact ANDY OnCall®, and we will send a qualified skilled craftsman for a FREE Estimate! How does ANDY OnCall® Work?  Our craftsmen have over 10 years experience and ANDY OnCall® handyman service provides a one year WRITTEN WARRANTY on craftsman workmanship. Always available to you, ANDY OnCall® handyman service is committed to fair and honest interaction with our customers. Priced By The Job, Not By the Hour! Call us for a free estimate – we’re even available for evening and weekend appointments. And remember the job can start immediately. Whether to fix a fence, caulk a tub, or hang a blind, ANDY OnCall® has a craftsman for your job. We are dedicated to using capable, qualified craftsmen to perform services for homeowners in a timely and efficient manner. We have had ANDY OnCall® out several times. We have been very pleased with the fact that they take the time to do the job right. If anything proves to be not exactly as we want it, they quickly return to make sure they have it to our satisfaction. Recently I had my first experience using your company for a necessary repair. Dwayne Ward repaired the steps on the front of my home. His manner was very professional when he gave me an estimate. I was impressed that I was able to get the cost and date of service on the same visit and was especially pleased with the fair price. I am delighted with the appearance of the front steps, as well as the professional and efficient manner with which Dwayne performed his craft. I will recommend Dwayne and ANDY OnCall® to friends and acquaintances. I was so pleased by the way my call was handled - very polite and business wise. The young man, Jerry Brown, corrected my carpenter problem - he, too, was very polite and businesslike. Then, to my surprise, I received a follow-up phone call a couple of days ago, checking to see if the repair was okay. Then, today, a note in the mail saying 'thanks' and another coupon. My only complaint is that 'assorted yard work' is not listed as a job you can handle. Oh well! I guess we can't have everything.